44 Magnum cartridges complete an excellent hunting pistol and field gun set-up. When hunting or defending yourself from dangerous game your shots have to count. A 44 Magnum full metal jacket round has devastating penetration, more than capable of stopping large game. 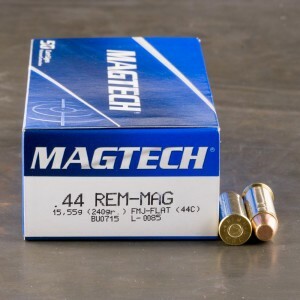 44 Magnum FMJ ammunition also offers a more affordable option for practice and plinking. Full metal jacket rounds for the 44 Magnum comes in two distinct types. The most common 44 FMJ load is a lead core surrounded by the copper jacket. This type is most common and often the most affordable. The second type is hardcast lead rounds which offer more penetration and are preferred for dealing with large game. Doesn't cycle in my semi-auto carbine, but probably fine in revolvers and lever actions. great for target shooting and runs fairly clean.